Are you looking for a FUN solitaire game with big, clear and beautiful graphics? Look no further than Classic Solitaire for Mac OSX (or Classic Solitaire for Windows)! SolSuite is the world's most complete solitaire collection, with over 650 different solitaire games, including all of the world's best-known solitaire games, as well as a number of games that are new and unique. Solitaire Central is the web's oldest and most comprehensive solitaire information site, with thousands of solitaire rules, hundreds of the best solitaire downloads, and a huge directory of online solitaire games. So look around, try some games, and learn something useful for a change! Goodsol Development has just released version 3.0 of Pretty Good Solitaire for Mac OS X, which includes an astonishing 550 different solitaire card games. 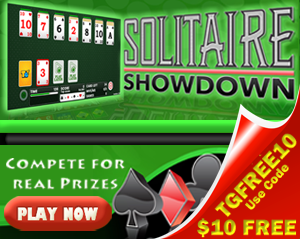 It is the solitaire game for players who take solitaire seriously! Defeat Dark Forces In The Chronicles Of Emerland Solitaire, Solitaire Arena review, Police officer caught playing Solitaire reprimanded, Fishing for chump change with social solitaire, and more solitaire news and reviews. An Intriguing Relationship Between Solitaire and Texas Hold'em, Caught Playing Solitaire, Do People Really Want Social Games? & more solitaire news! Here is a very important question about the next generation of the venerable Windows operating system: What will solitaire look like on Windows 8?